Organic Lavender Essential Oil. 30 ml (1 oz). USDA Certified 100% Pure, Undiluted, Therapeutic Grade. otanical Name: Lavandula angustifolia * Plant Part: Flowering Tops * Extraction Method: Steam Distilled * Country of Origin Bulgaria * Description: An evergreen woody shrub growing to 3 feet high with green, narrow, linear leaves producing violet-blue flowers. The entire plant is covered with oil glands, which are in the star-shaped hairs that cover the plant. 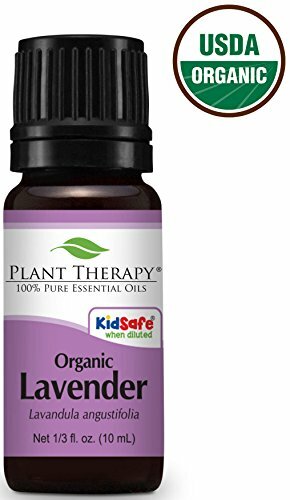 * Common Uses: Lavender Organic Essential Oil properties include analgesic, anti-convulsive, anti-depressant, antiphlogistic, antirheumatic, antiseptic, antispasmodic, antiviral, bactericidal, carminative, cholagogue, cicatrisant, cordial, cytophylactic, decongestant, deodorant, and diuretic. Herbalist regards Lavender as the most useful and versatile essential oil for therapeutic purposes from easing sore muscles and joints, relieving muscle stiffness, clearing the lungs and sinuses from phlegm to healing wounds and dermatitis. Lavender Essential Oil is most commonly associated with burns and healing of the skin. It also has antiseptic and analgesic properties which will ease the pain of a burn and prevent infection. It also has cytophylactic properties that promote rapid healing and help reduce scarring. The scent of Lavender is said to have a calming effect on the body and it can be used to reduce anxiety, stress and promote sleep. It is a popular choice amongst both aromatherapists and massage therapists for its combination of therapeutic quality and pleasant floral scent. * Consistency: Thin * Note: Top * Strength of Aroma: Strong * Blends well with: Bay, Bergamot, Chamomile, Citronella, Clary Sage, Geranium, Jasmine, Lemon, Mandarin, Orange, Palmarosa, Patchouli, Pine, Thyme, Rosemary, Rosewood and Ylang-ylang. * Aromatic Scent: Lavender Organic Essential Oil has a sweet floral scent with strong camphor aroma that is long lasting. * History: Lavender is adapted to living in a dry climate and has a strong stamina to grow abundantly at lower elevations of even 1000 meters. Organic Lavender Essential Oil. USDA Certified 10 ml (1/3 oz). 100% Pure, Undiluted, Therapeutic Grade. Certified Organics: This Certified Organic Oil is USDA Certified. * Botanical Name: Lavandula angustifolia * Plant Part: Flowers * Extraction Method: Steam Distillation * Origin: Bulgaria * Description: Lavender is an evergreen woody shrub, up to 1 meter tall, with pale green, narrow linear leaves and violet blue flowers. * Color: Pale yellow to yellow liquid. * Common Uses: Properties of Organic Lavender Essential Oil include analgesic, anti-convulsive, anti-depressant, anti-phlogistic, antirheumatic, antseptic, antispasmodic, antiviral, bactericide, carminative, cholagogue, cicatrisant, cordial, cytophylactic, decongestant, deodorant, and as a diuretic. Herbalist regards Lavender as the most useful and versatile essential oil for therapeutic purposes. Lavender is the essential oil most commonly associated with burns and healing of the skin. It also has antiseptic and analgesic properties which will ease the pain of a burn and prevent infection. It also has cytophylactic properties that promote rapid healing and help reduce scarring. Lavender is a popular choice amongst both aromatherapists and massage therapists for its combination of therapeutic quality and pleasant floral scent. * Consistency: Thin * Note: Top * Strength of Aroma: Strong * Blends well with: Bay, Bergamot, Chamomile, Citronella, Clary Sage, Geranium, Jasmine, Lemon, Mandarin, Orange, Palmarosa, Patchouli, Pine, Thyme, Rosemary, Rosewood and Ylang-ylang. * Aromatic Scent: Organic Lavender Essential Oil has a sweet floral note preferred by many. * History: Lavender is adapted to living in a dry climate and is native to the western half of the Mediterranean, reaching altitudes of up to 1800 meters. It is believed that the Romans and the Benedictine monks subsequently introduced it to rest of Europe. * Cautions: Lavender Essential Oil is non-toxic, non-irritating and non-sensitizing.